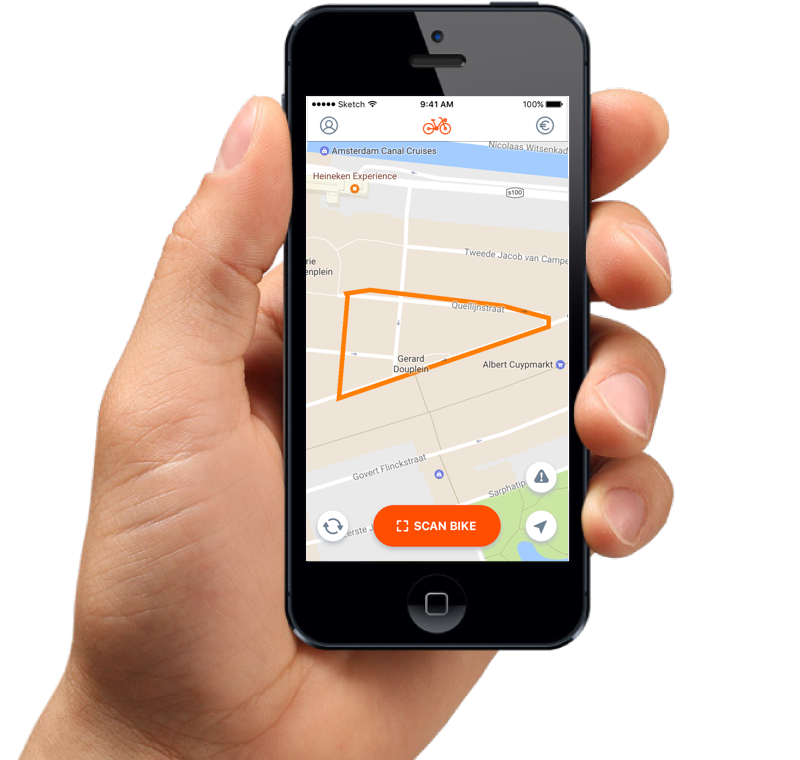 Your FlickBike journey starts with finding a FlickBike near you. FlickBikes are instantly available on city streets. You will see a map showing all FlickBikes. Finish the registration process in order to start using FlickBikes. Select a FlickBike near you and reserve it. The bike will be dedicated to you for 15min. Enjoy the ride. FlickBikes are made of light-weight aluminium, have air-less tires and are charging themselves with a solar panel. 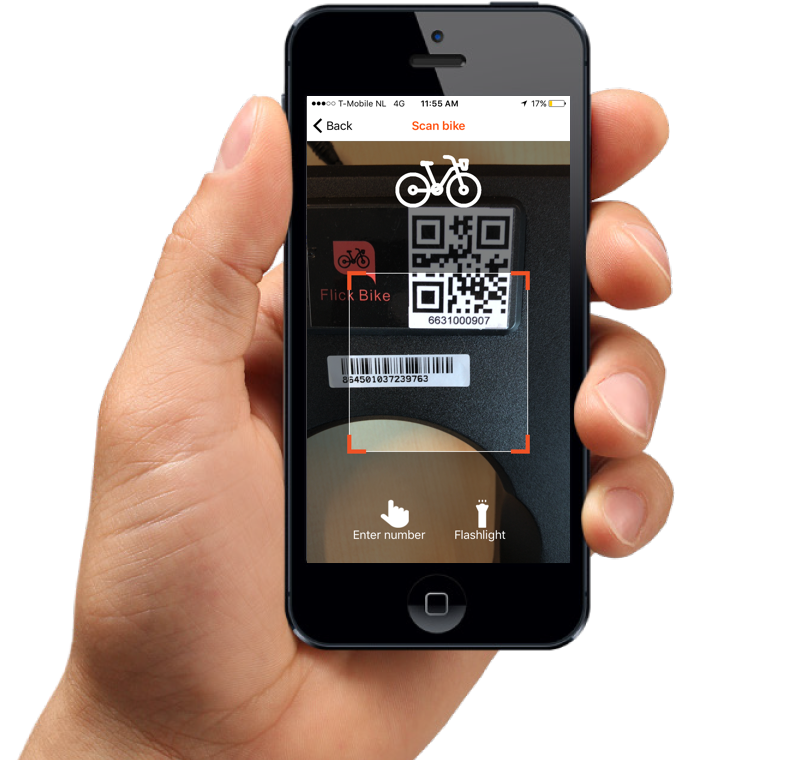 Open the lock by using your FlickBike app and scanning the QR code. Ride to your destination, you pay €1,- for each 30 minutes. If you have a Promo code, you will find the discount on your invoice. FlickBike is awesome because you don't need to bring back a bike to a certain location. That said, users must follow bike parking rules and should respect citizens and visitors. The most important rule is that FlickBikes should be parket in designated racks, like all other bikes in the city. Like any bike, park the FlickBike only in designated bike parking locations, docks, racks and staples. Check the mobile app whether you are not located in a restriced parking zone. If so, please move to a valid parking space. Manually close the lock, it will notify a confirmation with a bleem sound and in your app. Remember: as long as you keep the bike open, you are being charged.All your rides are charged on your credit card or bank account periodically through a generated FlickBike invoice. Avoid parking in underground garage, tunnels or any place where the city council have restricted parking. For more information about parking in Amsterdam, click here. Parking rules and regulations are different in each city district, event, city and/or country. In oder to avoid parking fees while parking a FlickBike in Amsterdam, please review the city rules and regulations.